A final reminder that this year’s Public Information Day will be held on Tuesday 30th October between 2.00 pm and 7.00 pm in An Talla, Crossapol. Refreshments will be available throughout the day. Decommissioning is the term for the removal of the wind farm from the site at the end of its life. The lease of the seabed from the Crown Estate will be for 50 years. The turbines will have an anticipated life of 20-25 years. The original turbines may therefore be replaced after 20-25 years, enabling the wind farm to be productive for the whole life of the lease. However, whenever the productive life of the wind farm, or any part of it, ends it will be removed from the site. That removal will be a massive operation in itself. It will be carried out under the requirements of the Energy Act 2004 and in accordance with the best practice at that time. The current best practice requires all elements of the windfarm having visual, sea-use or environmental impacts to be removed. The process is essentially the construction process in reverse. It’s also expected to take a similar period of time and have similar environmental impacts as the original construction phase. The Environmental Statement (ES), which will be such an important part of the consenting and licensing process, will give equal weight to the effects of the decommissioning of the wind farm as it will to its building and operation. The final design of the wind farm will therefore take account of the need for decommissioning. The Energy Act requires the Secretary of State to approve the project’s decommissioning plan before construction starts. The plan cannot be finalized until after engineering design for the wind farm has been completed and this is confirmed after the licensing and consenting process. Finally, the decommissioning will take place relatively far in the future and be a very expensive process. Therefore, a financial security arrangement, funded by SPR, will be agreed with the regulators before construction begins. This will guarantee that the decommissioning plan can be funded and carried out when the time comes. · An update of SPR’s technical and environmental studies. There will be a chance to discuss these and any other aspects of the project with the project team and a number of other specialist staff from SPR. There will also be a number of ways of making comment. Avid readers will recall that I outlined the background and purpose of this important document in my last update. It’s a legally required part of the planning application, written by independent consultants. It assesses the environmental impacts that the building, operation and decommissioning of the project could have and how any significant impacts can be reduced or avoided. Each of these headings will be studied in detail and the final Environmental Statement will be the result of a process that has continually evolved the project design in order to take account of environmental impacts. This is the process which is just beginning now. The Environmental Statement will be used as a very important (but not the only) piece of evidence to weigh in the balance when the decision is made whether to give permission to build the windfarm. If permission is given, the ES may also form the basis of any conditions imposed on the development. No responsible developer, such as SPR, will propose an effect on the environment that is outside the law and neither can any regulator approve such a proposal. The Environmental Statement will be used to demonstrate and ensure compliance with the law regarding offshore windfarm development. While there will be no specific presentation at the PID on the process of producing an Environmental Statement, SPR staff will be happy to discuss any aspect of it on the day. · What’s a pre?application consultation? · What’s a decommissioning plan? This year’s Public Information Day (PID) for the project will be held on Thursday 4th October between 2.00pm and 7.00pm. The venue has still to be finally confirmed. The format will be the same as at the last PID; members of the public are invited to drop in anytime during the day to view a number of information and consultation displays. There will be a chance to discuss these and any other aspects of the project with the project team and a number of other specialist staff from SPR. There will also be a number of ways of making comment. There have been some significant changes to aspects of the project since the last PID 14 months ago. This PID will explain the effects of these changes and also consult people on how the project should develop further in the future. There will be further information about the day, including confirmation of the venue, in my next update. · What is the Environmental Statement? It’s the document used to convey the results of the Environmental Impact Assessment (EIA) to the regulator, Marine Scotland, and all others interested in the application. It provides a description of the project (its construction, its operations/ maintenance and its eventual decommissioning). It also describes the environmental impacts the project could have, the ways significant impacts can be reduced or avoided and the research data used as evidence. It is a legal document forming part of the planning application in 2014. · What’s the Environmental Impact Assessment? This is the first step towards the Environmental Statement and, as the name suggests, the EIA assesses the environmental impact of the project. The immediate objectives of the EIA are to improve the project’s environmental design, check its environmental acceptability and identify ways to reduce any impacts. The main long term objective is to avoid serious damage to the environment. It works by identifying any changes needed to the project and then assessing those changes in turn, in order to refine the project design and reduce environmental impacts as much as possible. Most of the Environmental Impact Assessment work will be done in 2013 but work has already started on possible effects on basking sharks and bird life at the site. · How complicated is the Environmental Statement? As Marine Scotland and others interested require more and more detail, the ES gets quite large and technical. For this reason a Non Technical Summary (NTS) is produced which may, for example, summarise a 400 page ES in 20 pages. To keep the ES itself to a manageable size and readable by the layperson, it will refer to Technical Appendixes which are very detailed reports on individual topics. All are usually public documents when planning is applied for. · Who writes the ES? It will be produced for SPR by professional, independent environmental consultants, who will in turn employ specialist sub-contractors. · How can we be sure the ES is accurate and impartial? Windfarm Environmental Statements are rigorously evaluated by regulators and also non government agencies and the general public. The issues can also end up being discussed at formal planning inquiries so developers must ensure evaluations are accurate. An inaccurate Environmental Statement would invite serious problems for the developer at the decision making stage. Incorrect decisions made by regulators based on an inaccurate Environmental Statement also invite problems for them. 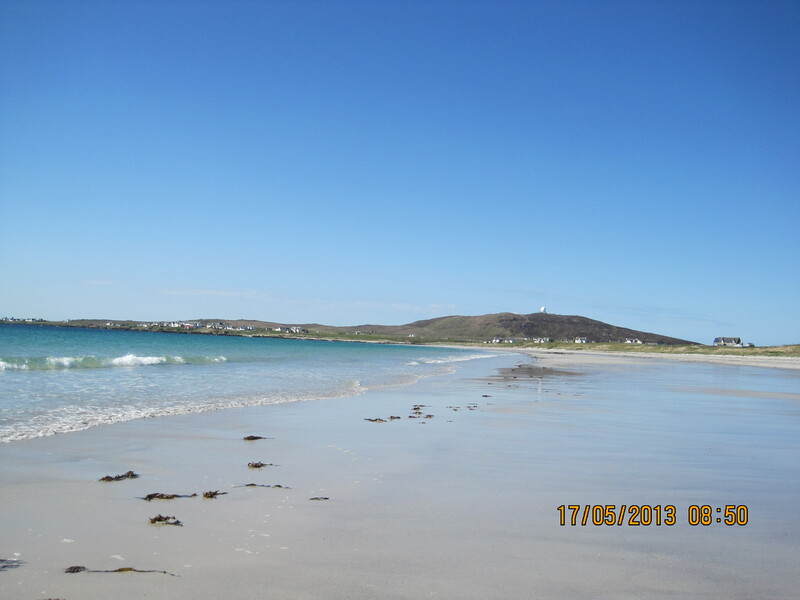 · When will Tiree see the ES? · What aspects of the environment will the ES report on? This is what makes it such an important document. This will be dealt with in my next update. Detail of what aspects of the environment the Environmental Statement will report on. 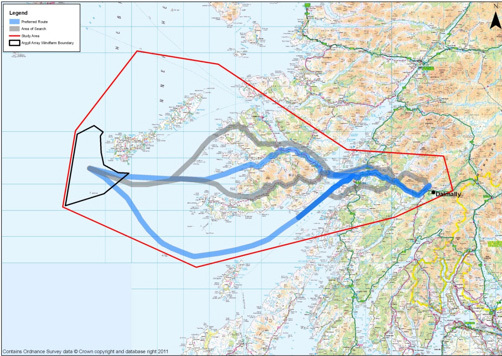 SNH is currently conducting a Basking Shark survey of the Skye-Mull area, including Tiree & Coll, as part of the environmental study with regard to possible MPA status for, or within, the Area. Tracking details have been impressively revealing in terms of shark location, confirming Tiree-Coll and Skerryvore as a basking shark hot spot. SPR’s survey boat is reported to have sighted 918 Basking Sharks within the proposed Tiree Array Area on 6th August. SPR has stated it is ‘minded’ to put this offshore. This is based on feedback from last years Public Information Days and the Scenario Mapping Consultations. Notwithstanding this background, SPR still wants to ‘provide more information‘ on locating a convertor onshore in Tiree. In SPR’s view there may be some ‘benefits in respect of jobs and infrastructure’. SPR advise that it is their intention to provide this information at their next Public Information Day. Irrespective of the reasons offered by SPR to reconsider their ‘minded’ offshore location for such HVDC converters, there are technical ,and operational reasons why SPR would wish to have one, at least, of what could be up to three such HVDC converters on shore Tiree . NTA has requested SPR to present appropriate visualisations and montages of both options. SPR has refused this request, consequently NTA is requesting Marine Scotland and Fergus Ewing, Scottish Government’s Minister for Energy, to intervene. We highlight that ‘dark skies’ at night are a major attribute to Tiree. SPR has consistently refused to present appropriate visualisations. NTA will endeavour to present same, shortly, using data provided by SPR. One of the matters that’s come up as I’ve been discussing the Fund with people recently is that many assume it only applies to education or training in engineering. This is far from the case and the range of activities it has been set up to support is very wide.The Background and Rules of the Fund are published elsewhere i An Tirisdeach to emphasise that. In fact, the range of activities is even wider than that and the Rules give more detail. Can I also remind those interested that the deadline for applications to the Fund is 31st August. Those who have made informal enquiries are reminded that they still need to submit a formal application to the Fund. Because of lack of space, the minutes of the meetings which set up the RESET Fund will be published in the next edition. · What’s in an Environmental Statement? Questions or comments If anyone has any questions or comments on any of the above, or indeed any aspect of the project, please contact me at – Donnie Campbell, ScottishPower Renewables Community Liaison Officer, Machair, Kilmoluaig in the first instance. My land line telephone number is 220 352, mobile number 07881 983 753 and email donnie@argyllarray.com. When the announcement of the amended timescales for the Argyll Array was made it was also announced that this would have no effect on the discussions regarding the Community Partnership Fund (CPF) proposed to be established in Tiree by SPR. This is still the case and the commitment to the Fund is unchanged. What has slipped, however, is the timescales for the agreement about the detail of the Fund. It was agreed between SPR and the Tiree Trust that the financial implications of the current Tiree Growth Plan should be estimated in order to provide a possible first stage in the process of agreeing the annual amount of the Fund. This will require an independent costing of the Growth Plan. SPR has undertaken to fund this work. The delay has been associated with the tendering process for that independent work. We hope that a contract can be awarded soon to allow it to begin. It was also said at the outset of the negotiations about the CPF that minutes of the meetings held between SPR and the Trust would be published at the end of each stage of discussions. The discussions have however not followed that kind of pattern so it is appropriate to now publish the minutes of the meetings that have taken place so far. These will be published in the next edition of An Tirisdeach, when more space is available, and simultaneously on the websites of SPR and the Tiree Trust. It is also intended that the first direct public consultation regarding the CPF will now take place when the costing of the Growth Plan becomes available. The project website www.argyllarray.com has now been updated to reflect the recent changes to the project timings. It also now carries electronic copies of all the updates published in An Tirisdeach and copies of the indicative photomontages used at the June 2011 Public Information Day. A number of people have asked for clarification of the new timetable for the project. I’ve therefore listed the most important revised dates below. It should be noted that these dates are those that are currently planned and are subject to change, especially the milestones that are still some years in the future. Some aspects, such as the date of the planning decision are also outwith SPR’s control. · the other passing undersea by the south of Mull. Both routes would land north of Oban and then follow the A85 to Dalmally. 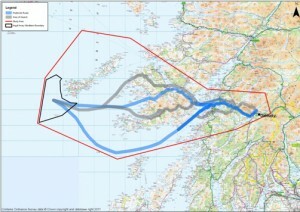 All of the onshore cables will be underground, both on the mainland and if they cross Mull. We will undertake environmental and technical surveys of the routes in 2013, and following these will be able to define the exact proposed route of the cable. The second meeting with Tiree Community Development Trust to discuss this initiative took place on the 14th of February and the third meeting on 21st February. A joint report on the meetings will appear in the next issue of An Tirisdeach. A reminder that any young person interested in applying for a place on this year’s programme should contact either myself or Ralph Thornton on 0141 614 0418. Staff at Tiree High School will also be able to give prospective candidates further information and support. Obviously, places are open to both female and male applicants. Further to the item in the last update, any group seeking funds from the Highlands and Islands part of the Fund can download a prospectus from www.communities.gov.uk/documents/regen eration/pdf/2085591.pdf. Preliminary research has now been completed for SPR regarding the siting of the converter station at the wind-farm end of the grid export cable route to Dalmally. Most will recall that a short-list of possible export cable routes has already been drawn up, all of which involve either a route over Mull to Oban or a completely sub-sea route to Oban, with no cable coming on to either Coll or Tiree. At the moment, SPR is minded to apply for permission to site the converter station offshore within the wind farm and not onshore in Tiree. The current position is based on feedback received through last year’s Public Information Day (PID) on Tiree, and the Scenario Mapping consultations. However, SPR has agreed with Tiree Community Development Trust to provide more information on the onshore convertor station at this summer’s Public Information Day. There are some benefits in respect of jobs and infrastructure on Tiree which would occur irrespective of the strategy for the windfarm. The island’s views will be sought at the PID in the summer, and if there is strong feedback in favour then SPR would reconsider the possibility of an onshore location.